Evolution of life Depicting the evolution of life on Earth. Earth (upper left) was born from clouds of gas and dust surrounding the Sun, which in turn was born from gas which condensed in our galaxy (upper right). Once the Earth started to cool after its formation, oceans formed, which were teeming with the basic chemical building blocks of life. From these components, first unicellular, then multi–cellular organisms evolved. As time progressed, larger predatory animals evolved, such as cartilaginous fish like the shark (center). These, and the bony fish (lower frame) which evolved later, paved the way for the conquest of the land and finally to evolution of man. Where did we come from? Where does life’s diversity come from? Where do new species come from? Why do some species go extinct? These are just a few of the questions that can be answered by an understanding of evolution, genetics. These disciplines explain the mechanisms that shape how organisms interact with their environment and, in turn, how the environment shapes organisms over many generations. 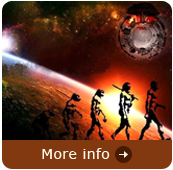 The theory of evolution is one of the best– known scientific theories around. Try to make it through a day without using or hearing the word "evolution" and you'll see just how widespread this theory is. Evolution is fascinating because it attempts to answer one of the most basic human questions: Where did life, and human beings, come from? The theory of evolution proposes that life and humans arose through a natural process. A very large number of people do not believe this, which is something that keeps evolution in the news. 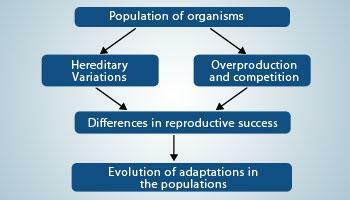 The study of evolution can be performed on different scales : Microevolution and macroevolution. Microevolution reflects changes in DNA sequences and allele frequencies within a species over time. 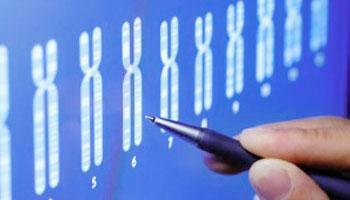 These changes may be due to mutations, which can introduce new alleles into a population. In contrast with microevolution, macroevolution reflects large– scale changes at the species level, which result from the accumulation of numerous small changes on the microevolutionary scale. An example of macroevolution is the evolution of a new species. Macroevolution, on the other hand, refers to change at or above the level of the species. Thus, evolution reflects the adaptations of organisms to their changing environments and can result in altered genes, novel traits, and new species. Evolutionary processes depend on both changes in genetic variability and changes in allele frequencies over time. Mutations – One of the mechanisms of evolution Evolution absolutely depends on mutations because this is the only way that new alleles and new regulatory regions are created. Mutation : Mutation, a driving force of evolution, is a random change in a population's gene pool. It is a change in the nature of the DNA in one or more chromosomes. Mutations give rise to new alleles; therefore, they are the source of variation in a population. Mutations may be harmful, but they may also be beneficial. For example, a mutation may permit organisms in a population to produce enzymes that will allow them to use certain food materials. Over time, these types of individuals survive, while those not having the mutations perish. Therefore, natural selection tends to remove the less–fit individuals, allowing more–fit individuals to survive and form a population of fit individuals. Gene flow and evolution Gene flow is the transfer of alleles from one population to another population through immigration of individuals. In this example, one of the birds from population A immigrates to population B, which has less of the dominant alleles, and through mating incorporates its alleles in into the other population. 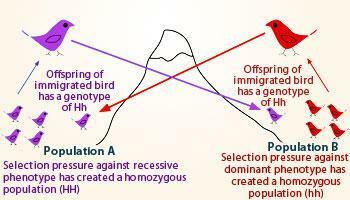 Gene flow: Another mechanism of evolution may occur during the migration of individuals from one group to another. When the migrating individuals interbreed with the new population, they contribute their genes to the gene pool of the local population. This establishes gene flow in the population. Gene flow occurs, for example, when wind carries seeds far beyond the bounds of the parent plant population. As another example, animals may be driven off from a herd. This forces them to migrate to a new population, thereby bringing new genes to a gene pool. Gene flow tends to increase the similarity between remaining populations of the same species because it makes gene pools more similar to one another. Genetic drift: Another mechanism for evolution is genetic drift. Genetic drift occurs when a small group of individuals leaves a population and establishes a new one in a geographically isolated region. For example, when a small population of fish is placed in a lake, the fish population will evolve into one that is different from the original. Fitness of a population is not considered in genetic drift, nor does genetic drift occur in a very large population. Summary of natural selection Darwin called this mechanism of evolutionary adaptation “natural selection” because the natural environment “selects” for the propagation of certain traits. Clearly, the most important influence on evolution is natural selection, which occurs when an organism is subject to its environment. The fittest survive and contribute their genes to their offspring, producing a population that is better adapted to the environment. The genes of less–fit individuals are eventually lost. The important selective force in natural selection is the environment. Environmental fitness may be expressed in several ways. For example, it may involve an individual's ability to avoid predators, it may imply a greater resistance to disease, it may enhance ability to obtain food, or it may mean resistance to drought. Fitness may also be measured as enhanced reproductive ability, such as in the ability to attract a mate. Better–adapted individuals produce relatively more offspring and pass on their genes more efficiently than less–adapted individuals. 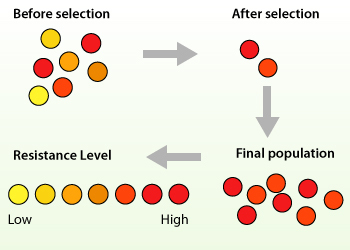 Several types of natural selection appear to act in populations. One type, stabilizing selection, occurs when the environment continually eliminates individuals at extremes of a population. Another type of natural selection is disruptive selection. Here, the environment favors extreme types in a population at the expense of intermediate forms, thereby splitting the population into two or more populations. A third type of natural selection is directional selection. In this case, the environment acts for or against an extreme characteristic, and the likely result is the replacement of one gene group with another gene group. The development of antibiotic–resistant bacteria in the modern era is an example of directional selection. Evolutionary tree This tree, illustrates the idea that all of life is related and can be divided into three major groups of organisms that includes all the descendents of a common ancestor. They are often referred to as the three domains or 'clades': Archaea, Bacteria, and Eukaryota. In spite of many evidences, studies and theories, we are still not aware of how the evolution actually occurs. If we go backwards at some point in the history of the earth it would have consisted of only the basic elements, the non–living materials like the air, water, sunlight etc. It is from this point that the possibility of non–living material giving rise to life forms arise. It is quite possible hypothetically, to consider the idea of a single species at the very beginning of evolutionary time almost 3.5 billion years ago. There are many theories of the exact evolution of life and the search for this knowledge continues. The central ideas of evolution are that life has a history–it has changed over time–and that different species share common ancestors. A comparison on the common features shows that an evolutionary process and a pattern of relationships exist between species. As lineages evolve and split and modifications are inherited, the evolutionary paths of species diverge. This produces a branching pattern of evolutionary relationships. Such evolutionary change and relationships are represented in “family trees,” or ‘phylogenetic’ trees. The trees show the relationships among organisms illustrate the idea that all of life is related. Many of the phylogenies one encounters are the“family trees” of groups of closely related species. The phylogeny shown below represents the basic relationships that tie all life on Earth together. Understanding evolution– The most compelling evidence for evolution comes from the study of genes Evidence of common descent of living things has been discovered by scientists working in a variety of fields over many years. This evidence has demonstrated and verified the occurrence of evolution and provided a wealth of information on the natural processes by which the variety and diversity of life on Earth developed. This evidence supports the modern evolutionary synthesis, the current scientific theory that explains how and why life changes over time. Evolutionary biologists document the fact of common descent: making testable predictions, testing hypotheses, and developing theories that illustrate and describe its causes. Biological evolution is genetic change in a population from one generation to another. The speed and direction of change is variable with different species lines and at different times. Continuous evolution over many generations can result in the development of new varieties and species. Likewise, failure to evolve in response to environmental changes can, and often does, lead to extinction. When scientists speak of evolution as a theory, they do not mean that it is a mere speculation. It is a theory in the same sense as the propositions that the earth is round rather than flat or that our bodies are made of atoms are theories. Most people would consider such fundamental theories to be sufficiently tested by empirical evidence to conclude that they are indeed facts. As a result of the massive amount of evidence for biological evolution accumulated over the last two centuries, we can safely conclude that evolution has occurred and continues to occur. All life forms, including humans, evolved from earlier species, and all still living species of organisms continue to evolve today. They are not unchanging end–products. The fossil record provides snapshots of the past Fossils are the preserved remains or traces of animals (also known as zoolites), plants, and other organisms from the remote past. 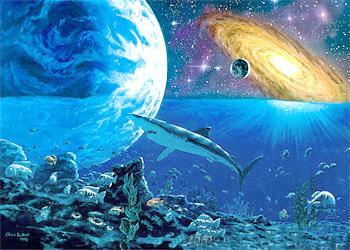 The best evidence about the origin of life and evolution of living organisms comes from the fossil record. Fossils can be preserved remnants of organisms (e.g., bones and teeth) or whole organisms embedded in amber, acid bogs and tar pits, or anywhere bacteria can't decompose a dead body. The totality of fossils, both discovered and undiscovered, and their placement in fossiliferous (fossil–containing) rock formations and sedimentary layers (strata) is known as the fossil record. Fossils can also be found in other forms (e.g., an animal's footprint). A scientist who studies fossils is a paleontologist. Remains of animals and plants found in sedimentary rock deposits give us an indisputable record of past changes through vast periods of time. This evidence attests to the fact that there has been a tremendous variety of living things. Some extinct species had traits that were transitional between major groups of organisms. Their existence confirms that species are not fixed but can evolve into other species over time. Phials containing samples for carbon dating using accelerator mass spectrometry (AMS). All living material incorporates a radioactive isotope of carbon, carbon–14 (14C), and a stable isotope, carbon–12 (12C), into its tissue at a known ratio. When the tissue dies the amount of 12C remains constant, but 14C decays. Measuring the amount of 14C compared to 12C in a sample indicates how long ago the tissue died. Carbon dating using AMS requires only a very small sample of material, minimizing the damage to a specimen. Samples must be protected against contamination from material of a different age. By studying the fossil record, paleontology reveals the existence of species that have become extinct or have evolved into other species. Studies using radioactive dating (Radiometric dating (often called radioactive dating) is a technique used to date materials such as rocks, usually based on a comparison between the observed abundance of a naturally occurring radioactive isotope and its decay products, using known decay rates ) and half–life indicate that the earth is about 4.6 billion years old. 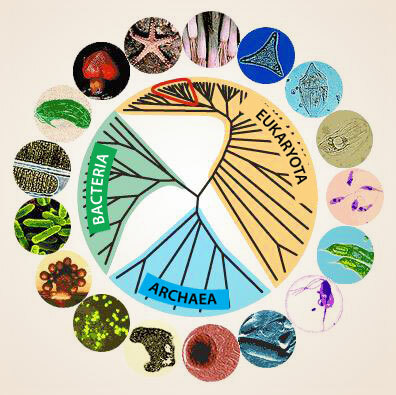 Prokaryotes were the first organisms to develop on earth, and they are the oldest fossils. Paleontologists have discovered many transitional forms that link older fossils to modern species; such as the transition from Eohippus (dawn horse, is an extinct genus ) to the modern horse, Equus (a genus of animals including horses, donkeys, zebras and onagers). 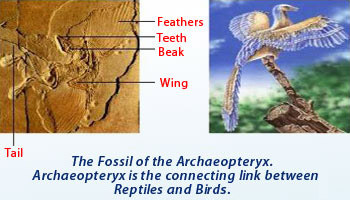 Archaeopteryx is a fossil that links reptiles and birds. Studying anatomical similarities The study of comparative anatomy entails examining the morphology of various anatomical structures among species, in an effort to establish a relationship between species. Living things on earth are fundamentally similar in the way that their basic anatomical structures develop and in their chemical compositions. No matter whether they are simple single–celled protozoa or highly complex organisms with billions of cells, they all begin as single cells that reproduce themselves by similar division processes. After a limited life span, they all grow old and die. The study of different structures contributes to scientists' understanding of the evolution of anatomical structures and of evolutionary relationships. The wing of a bat, the lateral fin of a whale, and the human arm all have the same internal bone structures, although the function of each varies. These structures, known as homologous structures, have a common origin and reflect a common ancestry. Analogous structures, such as a bat's wing and a fly's wing, have the same function. However, the similarity is superficial and reflects an adaptation to similar environments, not descent from the recent common ancestor. Vestigial structures, such as the appendix, are evidence that structures have evolved. The appendix is a vestige of a structure needed when human ancestors ate a very different diet. Biochemical Comparisons Biologists use structural and physiological characteristics to determine levels of similarity and hence establish evolutionary links between organisms. This is evident from the way organisms have been classified. Increasingly, with improved understanding of amino acid and DNA sequencing , biologists are using molecular information to determine evolutionary relationships. For example, comparing differences in amino acid sequencing in the blood protein hemoglobin is an indicator of relationships between primates. Organisms that have a common ancestor will have common biochemical pathways. The more closely related the organisms are to each other, the more similar their biochemistry is. Humans and mice are both mammals. This close relationship is the reason that medical researchers can test new medicines on mice and extrapolate the results to humans. Thus, the study of the comparative biochemistry shows that certain similar molecules occur in different groups of animals. This can be compared to the homologous structures. Although the biochemistry of organisms was not well known in Darwin's time, modern biochemistry indicates there is a biochemical similarity in all living things. For example, the same mechanisms for trapping and transforming energy and for building proteins from amino acids are nearly identical in almost all living systems. For example, the structure of hemoglobin present in man, chimpanzee, gorilla and gibbon show remarkable similarities. Hemoglobin is a protein that has four polypeptide chains. Each polypeptide chain is made up of a fixed number of amino acids. The hemoglobin of chimpanzees differs from that of man in only 1 amino acid, of gorilla in 3 amino acids and of gibbon in 8 amino acids. This indicates a common ancestry between the various primate groups. 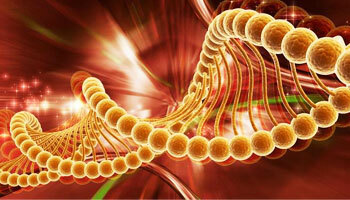 DNA and RNA are the mechanisms for inheritance and gene activity in all living organisms. The structure of the genetic code is almost identical in all living things. This uniformity in biochemical organization underlies the diversity of living things and points to evolutionary relationships. 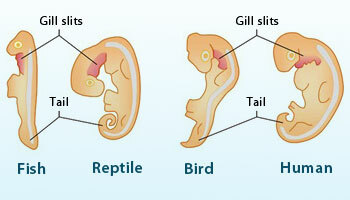 Many vertebrates (including humans) demonstrate a primitive tail at certain stages of embryonic development. Darwin noted the striking similarity among embryos of complex animals such as humans, chickens, frogs, reptiles, and fish. He wrote that the uniformity is evidence for evolution. He pointed out that human embryos pass through a number of embryonic stages inherited from their ancestors because they have inherited the developmental mechanisms from a common ancestor. These mechanisms are modified in a way that is unique to an organism's way of life. The similarities in comparative embryology are also evident in the early stages of development. For example, fish, bird, rabbit, and human embryos are similar in appearance in the early stages. They all have gill slits, a two–chambered heart, and a tail with muscles to move it. Later on, as the embryos grow and develop, they become less and less similar. Closely related organisms go through similar stages in their embryonic development. For example, all vertebrate embryos go through a stage in which they have gill pouches on the sides of their throats. In fish, the gill pouches develop into gills. In mammals, they develop into Eustachian tubes in the ears. 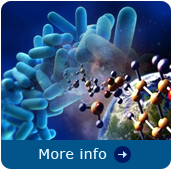 Molecular Biology and evolution – Billions of years of evolution has formed the diversity of life on Earth, all based on DNA Molecular Biology is the basic science that seeks an understanding of life processes in terms of the properties and functions of molecules that make up living cells. The scope of questions addressed in Molecular Biology ranges from evolution to development to the regulation of gene expression. The earth's environments are constantly changing, usually in subtle and complex ways. When the changes are so great as to go beyond what most members of a population of organisms can tolerate, widespread death occurs. As Charles Darwin observed, however, not all individuals always perish. Fortunately, natural populations have genetic diversity. Those individuals whose characteristics allow them to survive an environmental crisis likely will be the only ones able to reproduce. Subsequently, their traits will be more common in the next generation–thus, evolution of the population occurs. This process of natural selection resulting in evolution can be easily demonstrated over a 24 hour period in a laboratory Petri dish of bacteria living in a nutrient medium. When a lethal dose of antibiotic is added, there will be a mass die–off. However, a few of the bacteria usually are immune and survive. The next generation is mostly immune because they have inherited immunity from the survivors. That is the case with the purple bacteria in the Petri dishes shown below–the bacteria population has evolved. This same phenomenon of bacteria evolution speeded up by human actions occurs in our own bodies at times when an antibiotic drug is unable to completely eliminate a bacterial infection. That is the reason that medical doctors are sometimes hesitant to recommend an antibiotic for their patients and insist that the full dosage be used even if the symptoms of illness go away. They do not want to allow any potentially antibiotic resistant bacteria to survive. Example of Natural Selection: Antibiotic Resistance Bacteria exhibit natural variation in ability to resist antibiotics. Variation in antibiotic resistance is due to variation in certain genes carried by the bacteria. When you take an antibiotic the least resistant bacteria die first. People have developed many new varieties of plants and animals by selective breeding. This process is similar to the bacteria experiment described above. Selection of specimens to breed based on particular traits is, in effect, changing the environment for the population. Those individuals lacking the desirable characteristics are not allowed to breed. Therefore, the following generations more commonly have the desired traits. Species that mature and reproduce large numbers in a short amount of time have a potential for very fast evolutionary changes. Insects and microorganisms often evolve at such rapid rates that our actions to combat them quickly lose their effectiveness. We must constantly develop new pesticides, antibiotics, and other measures in an ever escalating biological arms race with these creatures. Unfortunately, there are a few kinds of insects and microbes that are now significantly or completely resistant to our counter measures, and some of these species are responsible for devastating crop losses and deadly diseases. If evolution has occurred, there should be many anatomical similarities among varieties and species that have diverged from a common ancestor. Those species with the most recent common ancestor should share the most traits. For instance, the many anatomical similarities of wolves, dogs, and other members of the genus Canis are due to the fact that they are descended from the same ancient canine species and still share 99.8% of their genes. Wolves and dogs also share similarities with foxes, indicating a slightly more distant ancestor with them. Molecular Evidence Molecular evidence involves identifying conservation in DNA and protein sequences as a basis for determining evolutionary relationships. Given the abundant evidence supporting the theory of biological evolution, it is highly probable that evolution has occurred and is still occurring today. However, there remains speculation in regards to the specific evolutionary path of some species lines and the relative importance of the different natural processes responsible for their evolution. Much has been added to our understanding of the nature of evolution since the 19th century. The understanding of these processes has become the basis for an overall synthetic theory of evolution. This theory encompasses multiple causes, including Charles Darwin's concept of natural selection, Gregor Mendel's experimental results concerning genetic inheritance, as well as a number of crucial 20th century discoveries. For example, since all aerobic organisms contain cells that carry out aerobic cell respiration, they all contain the polypeptide cytochrome c. A comparison of the amino acid sequence of cytochrome c among different organisms shows which organisms are most closely related. The cytochrome c in human cells is almost identical to that of our closet relatives, the chimpanzee and gorilla, but differs from that of a pig. 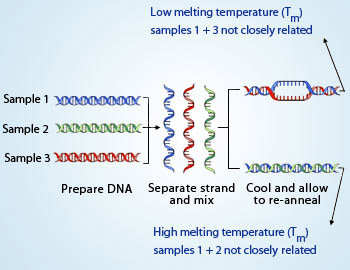 DNA is double–stranded, but the strands can be separated with sufficient heat and will reform (re–anneal) as the temperature falls. Single–stranded DNA from different species can be mixed together to identify the degree of similarity (as measured by complementary base pairs). Closely related sequences will join together (hybridize) more strongly as they share more complementary base pairs. The strength of the hybrid molecule (and degree of similarity) can be measured by how much heat is required to separate the strands. Closely related (conserved) sequences will have a higher melting temperature (TM) than distantly related sequences. Biogeographical evidence Biogeographical Distribution of Proteaceae can be Explained via Continental Drift. Most modern Marsupials are found almost exclusively in Australia (~ 70% of the extant species). Australia has few placental mammals compared to South America, even though environmental conditions are similar between the two regions. 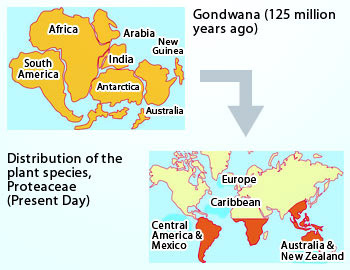 Exceptions to this correlation between biogeographical distribution and common ancestry can be explained due to continental drift. The theory of continental drift states that about 200 million years ago, the continents were locked together in a single supercontinent called Pangea, which slowly separated into seven continents over the course of 150 million years. Study of the location of marsupial fossils and the geographic distribution of living marsupials, which is limited almost exclusively in Australia, confirms this theory. Over 250 million years ago, there was one continental landmass (Pangaea) which split into current biogeographical regions. Closely related species that were separated by the breaking up of the continental landmasses can often be found localized to the regions where the continents were once connected. Shrubs of the family Proteaceae (e.g. Waratahs) can be found across Australia, as well as South America, Indo–China and parts of Africa. Galapagos Islands Darwin was particularly interested in the life forms of these Islands for his experimentation. 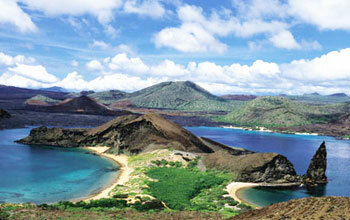 Darwin was particularly interested in the life forms of the Galapagos Islands. He noticed how many of the birds and other animals on the islands were found only there. The finches were particularly puzzling because Darwin found 13 species of finches not found anywhere else in the world, as far as he knew. He concluded that the finches had evolved from a common ancestor that probably reached the island many generations earlier. In the isolation of the Galapagos Islands, the original finches had probably evolved into the 13 species. Thus, evidence of common descent of living things has been discovered by scientists working in a variety of fields over many years. This evidence has demonstrated and verified the occurrence of evolution and provided a wealth of information on the natural processes by which the variety and diversity of life on Earth developed. This evidence supports the modern evolutionary synthesis, the current scientific theory that explains how and why life changes over time. Evolutionary biologists document the fact of common descent: making testable predictions, testing hypotheses, and developing theories that illustrate and describe its causes. Speciation is the evolutionary process by which new biological species arise Dahlia flower. Close–up of the "flower" of a dahlia (Dahlia sp. ), a popular garden plant and member of the Compositae family. This "flower" is actually a cluster of small individual flowers, or florets, with the outer florets maturing first. The broken color in flowers like these can be caused by genetic mutations induced by "jumping genes" (transposons) that move around in the plant's DNA. Dahlias originate from a handful of Mexican species that have been continuously interbred and hybridized to produce new forms since their introduction to Europe in 1789. Over 20 species are recognized today. A species is a group of individuals that share a number of features and are able to interbreed with one another. (When individuals of one species mate with individuals of a different species, any offspring are usually sterile.) A species is also defined as a population whose members share a common gene pool. The evolution of a species is speciation, which can occur when a population is isolated by geographic barriers, such as occurred in the isolation of Australia, New Zealand, and the Galapagos Islands. The variety of life forms found in Australia but nowhere else is the characteristic result of speciation by geographic barriers. Speciation can also occur when reproductive barriers develop. For example, when members of a population develop anatomical barriers that make mating with other members of the population difficult, a new species can develop. The timing of sexual activity is another example of a reproductive barrier. Spatial difference, such as one species inhabiting treetops while another species occurs at ground level, is another reason why species develop. Gradual versus rapid change Gradualism is the slow change from one form to another. Punctuated equilibrium implies long periods without appreciable change and short periods of rapid evolution. Darwin's theory included the fact that evolutionary changes take place slowly. In many cases, the fossil record shows that a species changed gradually over time. The theory that evolution occurs gradually is known as gradualism. In contrast to gradualism is the theory of punctuated equilibrium, which is a point of discussion among scientists. According to the theory of punctuated equilibrium, some species have long, stable periods of existence interrupted by relatively brief periods of rapid change. Gradualism and punctuated equilibrium are two ways in which the evolution of a species can occur. A species can evolve by only one of these, or by both. Scientists think that species with a shorter evolution evolved mostly by punctuated equilibrium, and those with a longer evolution evolved mostly by gradualism. Both groups of scientists agree that natural selection is the single most important factor in evolutionary changes in species. Whether the change is slow and gradual, or punctuated and rapid, one thing is certain: Organisms have evolved over time. Directed evolution – An evolutionary application Every biologist is familiar with how evolution has resulted in the incredible diversity and adaptations found in the natural world. Directed evolution uses a similar strategy to create biomolecules for use in diverse fields spanning industrial production, medical science, and basic research. The crucial difference is that, with directed evolution, results can be achieved much more quickly, in many cases with just a few rounds of mutagenesis and selection. Evolutionary biology, in particular the understanding of how organisms evolve through natural selection, is an area of science with many practical applications. The evolutionary approach is key to much current research in biology that does not set out to study evolution per se, especially in organismal biology and ecology. For example, evolutionary thinking is key to life history theory. Annotation of genes (Genome annotation is the process of attaching biological information to sequences. It consists of two main steps: identifying elements on the genome, a process called gene prediction, and attaching biological information to these elements) and their function relies heavily on comparative, that is evolutionary, approaches. The field of evolutionary developmental biology investigates how developmental processes work by using the comparative method to determine how they evolved. A major technological application of evolution is artificial selection, which is the intentional selection of certain traits in a population of organisms. Humans have used artificial selection for thousands of years in the domestication of plants and animals. More recently, such selection has become a vital part of genetic engineering, with selectable markers such as antibiotic resistance genes being used to manipulate DNA in molecular biology. It is also possible to use repeated rounds of mutation and selection to evolve proteins with particular properties, such as modified enzymes or new antibodies, in a process called directed evolution. Schematic representation of how antibiotic resistance evolves via natural selection The top section represents a population of bacteria before exposure to an antibiotic. The middle section shows the population directly after exposure, the phase in which selection took place. The last section shows the distribution of resistance in a new generation of bacteria. The legend indicates the resistance levels of individuals. Antibiotic resistance can be a result of point mutations in the pathogen genome at a rate of about 1 in 108 per chromosomal replication. The antibiotic action against the pathogen can be seen as an environmental pressure; those bacteria which have a mutation allowing them to survive will live on to reproduce. They will then pass this trait to their offspring, which will result in a fully resistant colony. Understanding the changes that have occurred during organism's evolution can reveal the genes needed to construct parts of the body, genes which may be involved in human genetic disorders. For example, the Mexican tetra is an albino cave fish that lost its eyesight during evolution. Breeding together different populations of this blind fish produced some offspring with functional eyes, since different mutations had occurred in the isolated populations that had evolved in different caves. This helped identify genes required for vision and pigmentation, such as crystallins and the melanocortin 1 receptor. Similarly, comparing the genome of the Antarctic icefish, which lacks red blood cells, to close relatives such as the Antarctic rockcod revealed genes needed to make these blood cells. Heavy use of antibiotics selects bacteria that are genetically resistant to the drug. With continued use of antibiotics, those resistant forms of the bacteria multiply and spread to other hosts. Eventually, resistant bacteria replace the population of once–sensitive bacteria. Evolutionary Biotechnology Evolutionary biotechnology applies the principles of molecular evolution to biotechnology, leading to novel techniques for the creation of biomolecules with a great variety of functions for technical and medical purposes. Several basic principles for the application of evolutionary strategies can be derived from a comprehensive theory of molecular evolution. Prerequisites for evolutionary biotechnology are summarized with respect to the different classes of biomolecules and a few, selected applications are described in detail. Concepts for the technical implementation of evolutionary strategies are presented which allow automatized, high throughput processes. Directed evolution, i.e. 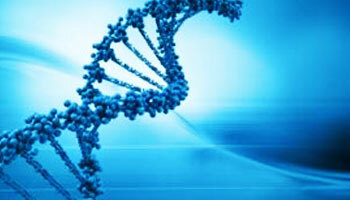 artificially–induced evolution, has become part of the jargon in biotechnology. Artificially evolved enzymes and other proteins are soon to become part of household and medical technologies. We will have protein–based drugs that, unlike the proteins inside our bodies, degrade slowly so that we don’t need to take so much of them. And as the stuff of futuristic novels, molecules are being developed to bind anthrax spores (Anthrax is an acute disease caused by the bacterium Bacillus anthracis. Most forms of the disease are lethal, and it affects both humans and other animals. There are effective vaccines against anthrax, and some forms of the disease respond well to antibiotic treatment. Anthrax spores can be produced in vitro and used as a biological weapon ), ricin molecules (Ricin , from the castor oil plant Ricinus communis, is a highly toxic, naturally occurring protein. A dose as small as a few grains of salt can kill an adult human. ), and other potential bioterrorism agents. All of these developments take advantage of one or more forms of test– tube evolution. Armed with a knowledge of how natural selection works and combined with the right kinds of laboratory technology, people can create molecules to perform seemingly any kind of function. In some of the more spectacular cases, these test tube evolution methods have created enzymes from purely random pools of DNA (or RNA) sequences. 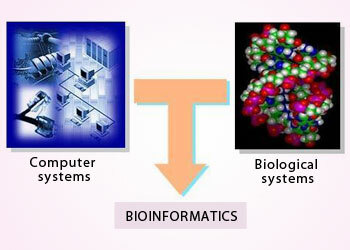 Bioinformatics and Evolution Bioinformatics is the application of computer technology to the management of biological information. Computers are used to gather, store, analyze and integrate biological and genetic information which can then be applied to gene– based drug discovery and development. The need for Bioinformatics capabilities has been precipitated by the explosion of publicly available genomic information resulting from the Human Genome Project. The goal of this project – determination of the sequence of the entire human genome (approximately three billion base pairs) – will be reached by the year 2002. The science of Bioinformatics, which is the melding of molecular biology with computer science, is essential to the use of genomic information in understanding human diseases and in the identification of new molecular targets for drug discovery. Bioinformatics is a branch of biological science which deals with the study of methods for storing, retrieving and analyzing biological data, such as nucleic acid (DNA/RNA) and protein sequences, structures, functions, pathways and genetic interactions. 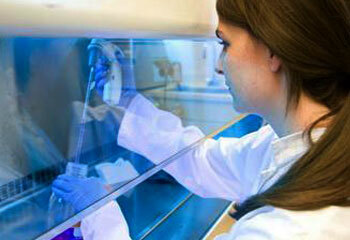 It generates new knowledge about drug designing and development of new software tools. Bioinformatics was applied in the creation and maintenance of a database to store biological information at the beginning of the "genomic revolution", such as nucleotide sequences and amino acid sequences. Development of this type of database involved not only design issues but the development of complex interfaces whereby researchers could access existing data as well as submit new or revised data. More recently, compare entire genomes, which permits the study of more complex evolutionary events, such as gene duplication (Gene duplication is any duplication of a region of DNA that contains a gene; it may occur as an error in homologous recombination, or duplication of an entire chromosome ), horizontal gene transfer (Horizontal gene transfer (HGT) refers to the transfer of genetic material between organisms. Horizontal gene transfer is the primary reason for bacterial antibiotic resistance ), and the prediction of factors important in bacterial speciation. Build complex computational models of populations to predict the outcome of the system over time. 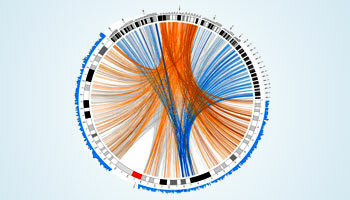 Future work endeavors to reconstruct more complex tree of life. Bioinformatics made possible to trace the evolution of a large number of organisms by measuring changes in their DNA Map showing shared genetic material between human chromosome 1 (lower half of outer ring) and the entire mouse genome (upper half of outer ring). The pace of evolutionary biology and its ramifications has outstripped public awareness as well as expanded beyond the knowledge base of most classical evolutionary biologists. It is thus difficult but important to recognize that evolutionary biology has implications to a new century of medicine, agriculture, biotechnology, and even law. The adjacent figure gives the information of the chromosomes. They are based on standard idiograms and arranged in a circle. The colored lines connect genes that are orthologous to one another. These are genes that have shared the same ancestry but may not necessarily now perform the same function. The numbers on the chromosomes represent scale bars. This map was created using Circos, software which visualizes complex genetic comparisons between different species or within the same species. Students educated with this knowledge will have an edge in the competitive job markets of the future, but at least in some areas of medicine, a basic public understanding of evolutionary principles may be essential in successfully waging the ongoing war with infectious diseases.